Chart No. 26 - Very Important Directional Contacts on the Symphisis Pubis [Pubic Symphysis] for Bladder Trouble and Inflammation, for Menstrual and Leg Cramps and Pains, for Sinus Congestion. The direction of the lines of force applied in a contact can be superior inferior or on an angle. The correctness is proved by the release of tension and soreness, as well as the lengthening of the short leg. 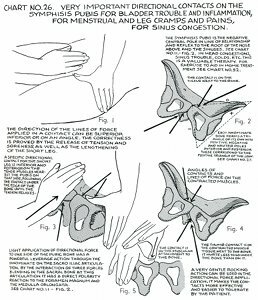 The symphisis pubis [pubic symphysis] is the negative central pole in line of relationship and reflex to the root of the nose above and the sinuses. See Chart No. 11, - Fig. 2. 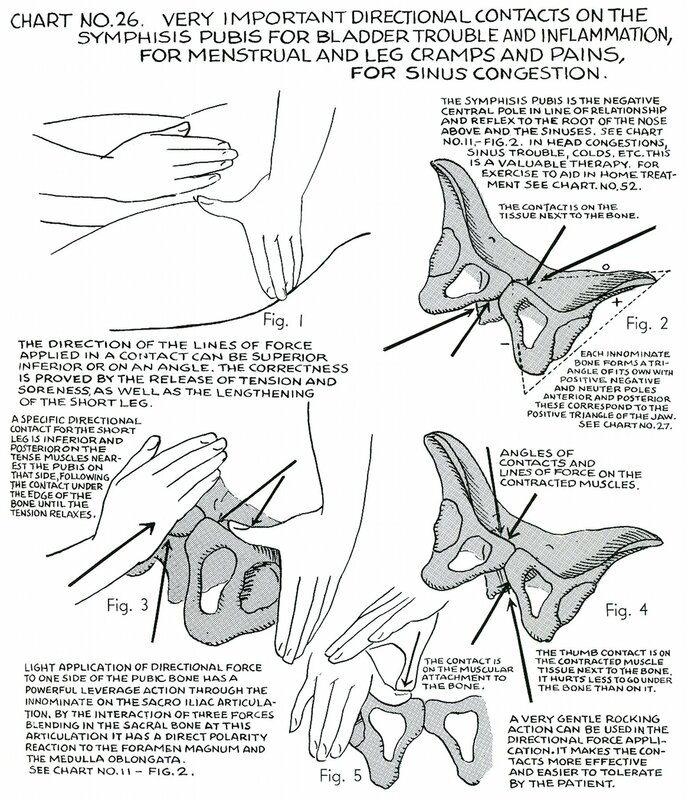 In head congestions, sinus trouble, colds, etc. this is a valuable therapy. For exercise to aid in home treatment see Chart No. 52. The contact is on the tissue next to the bone. 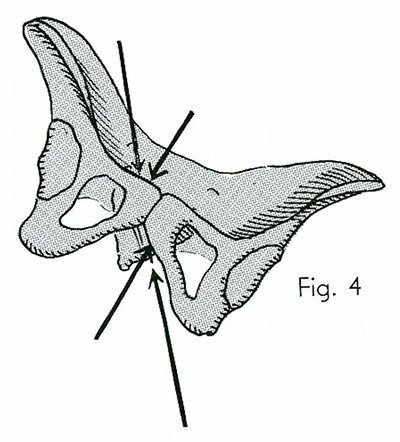 Each innominate [hip] bone forms a triangle of its own with positive negative and neuter [neutral] poles anterior and posterior. These correspond to the positive triangle of the jaw. See Chart No. 27. 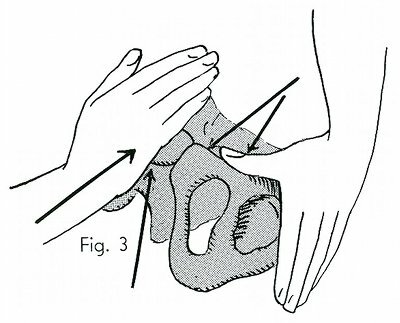 A specific directional contact for the short leg is inferior and posterior on the tense muscles nearest the pubis on that side, following the contact under the edge of the bone until the tension relaxes. Angles of contacts and lines of force on the contracted muscles. The thumb contact is on the contracted muscle tissue next to the bone. It hurts less to go under the bone than on it. Light application of directional force to one side of the pubic bone has a powerful leverage action through the innominate [hip] on the sacro iliac [sacroiliac] articulation. 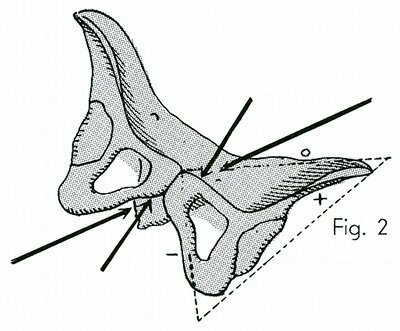 By the interaction of three forces blending in the sacral bone at this articulation it has a direct polarity reaction to the foramen magnum and the medulla oblongata. See Chart No. 11 - Fig. 2. 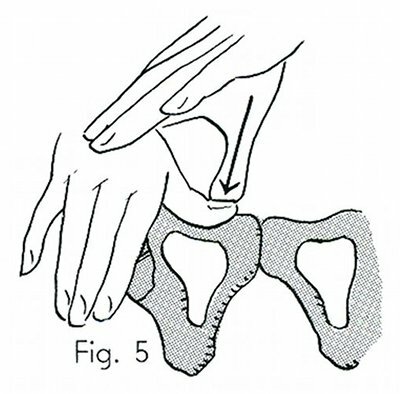 The contact is on the muscular attachment to the bone. A very gentle rocking action can be used in the directional force application. It makes the contacts more effective and easier to tolerate by the patient.